Sorry I haven’t updated in a while. I just came back from a two-week vacation in Europe, and then I went straight to Toronto for my showcase at NXNE. I went to something like nine different countries in the span of just a few days, and while it was really exhausting, I really did have the time of my life. I even got to spend my birthday in Paris! Not a bad way to get older, y’know? Then after all that, I got to spend a week in Toronto (one of the coolest music towns I’ve ever been to) and enjoy the city, festival, and play my music in a country I’ve never been to before, on my first international gig. Pretty amazing, though I’m mainly just glad I survived it all and I made it home alive. I just wanted to post a quick update and let you know I’m finally back home and back to work. 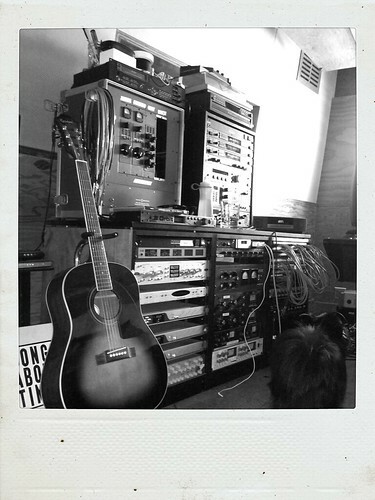 The picture above is from Dave Trumfio’s home studio. I spent a few hours with him the other day putting on the finishing touches on a single I’m releasing while I finish up the new record. It really does sound pretty great, and I can’t wait for you to hear it. Actually, make sure you hear it first by joining the email list! I just redesigned the join page, and my email list service has also just made this process extremely easy. All you have to do is click here and then click “Connect with Facebook,” confirm, and that’s it! I’m letting everyone on my email list download the new song for free, before it’s released, so make sure your name is on that list! You’d be a fool not to! Anyway, more soon, it’s good to be home.